Returning to Berlin from the Creative Commons Global Summit 2011 in Warsaw (see live-blogposts on the event), the political landscape of the city has been shaken by a Pirate Party election success. Two years ago, the German Pirate Party won 2 percent in the German federal election (see “Pirate Parties: Transnational mobilization and German elections“). Today, they boarded Berlin’s state parliament with 8.9 percent of the votes and 15 seats (see English Wikipedia). This is the first time the German Pirate Party was able to enter a state parliament, proving that the 2009 election results were not just a flash in the pan. The dimension of the win was completely unexepected even for the Pirate Party, which is best illustrated by the following fun fact: the Berlin Pirate Party had only nominated 15 candidates for the state-wide election, all of which are now members of the parliament; had the Pirate Party won only one more seat it would not have been able to fill it. The following Q&A is meant to give some background information to a non-German-speaking audience. Is the success of the pirate party in Berlin only a regional exception? Yes and No. 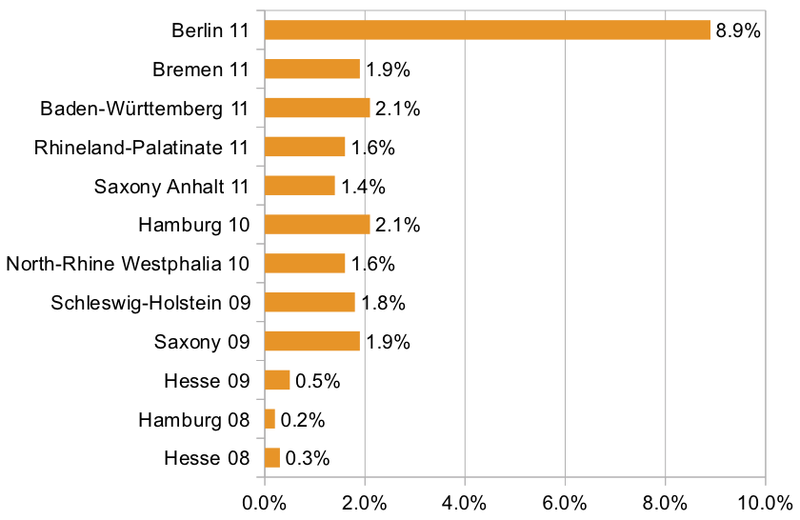 Yes, because at least so far the German Pirate Party has only succeeded in urban areas and not at all on the state level – even in city-states such as Hamburg it had not gotten more than 2.1 percent (see graph below). For now, the dimension of the election success of the Pirate Party in Berlin is a regional peculiarity. No, because the German Pirate Party is part of a transnational movement critical of the prevalent regime of strong intellectual property rights protection (see, again, “Pirate Parties: Transnational mobilization and German elections“), which manifests in currently 22 official registered and about 25 still unregistered national pirate parties. Has the Pirate Party overcome its male bias? Pirate Parties are regularly criticized for its gender bias. The Berlin chapter provides striking evidence for this bias. Only one (!) of the 15 Pirate Party members of the state parliament in Berlin will be a woman. Also the electorate of the Pirate Party in Berlin is dominantly male. Who are the Pirate Party candidates? What do they have in common? Most of the newly elected members of the Berlin state parliament (9 out of 15) have a professional background in the field of information technology and the majority has received a university degree. Is the Pirate Party a one-issue-party? The core of the pirate party brand are, of course, issues related to the Internet. And one wing of the German Pirate Party known as “Kernis” – relating to “Kern”, the German word for “core” – suggests that the Party should focus solely on these core issues; these include opposition to Internet surveillance or access controls as well as demands for substantial copyright reform. The other wing of the party, which is dominant in Berlin, favors developing a comprehensive program, addressing all kinds of issues. What other issues has the Pirate Party campaigned for in Berlin? The official TV spot for the Berlin election embedded below illustrates some of these issues. Is the Pirate Party politically left or right? In Berlin, the Pirate Party definitely belongs to the left political spectrum both in terms of its political program (see the previous question) and in terms of its electorate. Exit polls show that the Pirate Party mainly received votes from two sources: left-leaning parties (Social Democratic Party, The Left, and the Greens) and previous nonvoters.